Listening to Better Luck Next Life often feels like walking through a room filled with a thick, stifling mist, or unsuccessfully struggling to penetrate an omnipresent cloud of cigarette smoke. Royal Baths‘ brand of muddy rock ‘n roll redefines the labels of “hazy” and “narcotic.” Thanks to the deep and powerful rhythm section for the most part, their songs recall the very things that made the Velvet Underground and the Stooges distinct among proto-punk garage rockers. Originally based in San Francisco (the whole band has recently moved to Brooklyn), Royal Baths are probably the darkest product of the City’s contemporary psychedelic punk scene. The pieces on Better Luck Next Life, their second long-playing achievement, oscillate around a template of classic rock standards covered by a group of stoned, emotionally detached noiseniks. With frequent sluggish tempos and hypnotic repetition, the band seems to be playing their version of the Stooges‘ “I Need Somebody” over and over again, yet neither boring the listener nor making the comparison too obvious. While the actual timbre of his voice is noticeably different, singer Jigmae Bear’s delivery recalls Lou Reed‘s cool-but-somehow-affected phrasing. 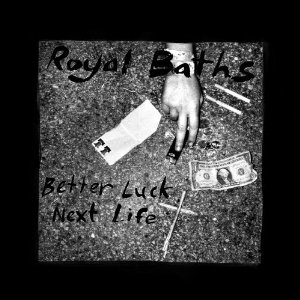 Also, the album’s production deserves an extra word of praise: Royal Baths make fantastic use of reverb and space, and Better Luck Next Life is, in fact, one of the best-recorded garage-revival records (and considerably less lo-fi than the debut). It’s just altogether too real to pass on it.